How can I create a new Fulcrum organization? How to create a new Fulcrum plan when you are already a member or owner of an existing Fulcrum plan. Fulcrum has a multiple-membership structure for user accounts. This allows you to log in with a single email address and password (user account) and have access to one or more Fulcrum plans. Log into the Fulcrum web app. 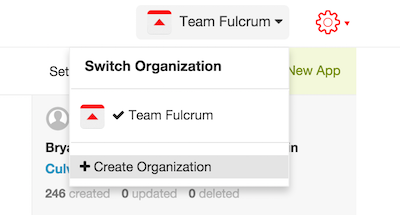 Click the drop-down menu on your organization name in the top right within the main Fulcrum homepage. There you’ll see Create Organization option under the list of the plans you are currently a member of. Click that and you’ll be prompted to select a plan level for your new organization. After you’ve set that up, clicking the organization selector in the top right will allow you to toggle between which plan you are accessing.